Background Inflammation is integral to joint damage and bone erosion in rheumatoid arthritis (RA). We reported previously that physiologic levels of exercise are anti-inflammatory and suppress local inflammation of joints in vivo. Objectives Our aim in this study was to demonstrate that physiological levels of exercise are potent systemic biological response modifiers that block monocyte/macrophage activation. Methods BalbC/Tg (NFκB-RE-luc)-Xen mice (12-14 wks old) carrying a transgene containing a modified firefly luciferase cDNA whose expression is under the control of NF-κB responsive elements were used to study the regulation of NF-κB activation by exercise (treadmill walking at 8 M/min). LPS (1 μg/gm body weight) was injected in the right foot to trigger inflammation. The mice were treated as follows: (i) no treatment (ii) exercise alone, (iii) LPS alone, (iv) pre-exercised (Pre-Ex) for 7 days prior to LPS injection, or (v) exercised post LPS injection (Post-Ex). The activation of NF-κB was assessed 2, 24, 48 or 120 h post-LPS injection by digitizing bioluminescence of luciferase activity (IVIS 200). Multiplex ELISA was used to assess the induction of proinflammatory cytokines in the serum. Human macrophages were enriched from healthy peripheral blood leukocytes and subjected to LPS stimulation with and without dynamic strain (2% at 0.5 Hz) for various time intervals to assess NF-κB activation. Results Exercise alone did not induce significant NF-κB activation in NFκB-RE-luc mice; whereas LPS injection in the right ankle provoked a robust systemic and local inflammatory response that was most severe within 2 h post-injection (Fig 1A). Both Pre-Ex and Post-Ex mice showed a significant inhibition of LPS-induced NF-κB activation. As expected, the NF-κB activation was primarily in lymphatic tissue and at the site of LPS injection (Fig 1B-C). Strikingly, exercise effectively suppressed LPS-induced NF-κB activation in all lymphatic tissues examined and at the site of injection. We next examined the tenacity of the effects of exercise and demonstrated that the anti-inflammatory response is transient, lasting only 24 h post-exercise. A. 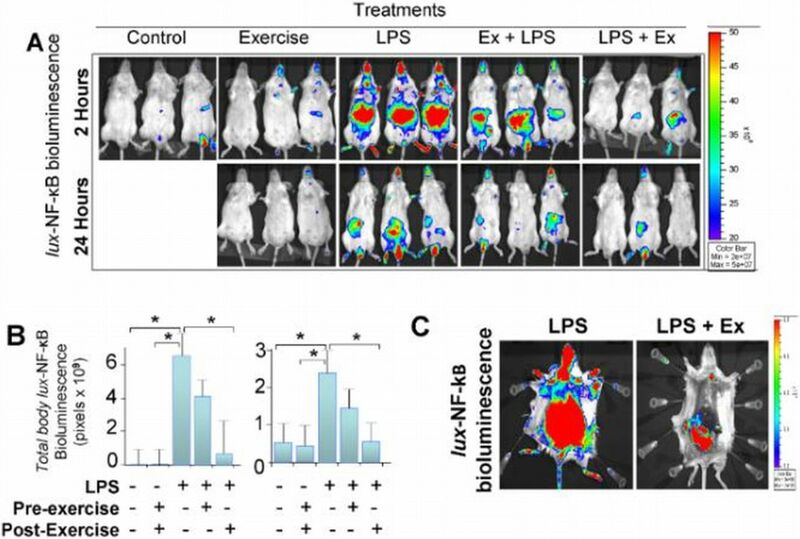 Exercise suppresses LPS-induced NF-κB activation. B. Suppression of inflammation is observed at the site of inflammation (left) and in the lymphatic organs (right). C. Assessment of total body NF-κB activation-induced biluminescence. *Denotes statistical sgnificance (P<0.05). Assessment of the consequences of NF-κB inactivation by exercise (Both Pre-Ex and Post-Ex) revealed the suppression of multiple pro-inflammatory cytokines: IL-1β, TNF-α, IL-6, IL-17, IL-12 and IL-8. However, the effects of exercise were more dramatic (<90%) in Post-Ex than Pre-Ex mice. Using primary human macrophages, dynamic strain significantly suppressed NF-κB activation. Conclusions These findings suggest that exercise suppresses both local and systemic inflammation by inhibiting NF-κB activation in monocytes/macrophages. Importantly, these effects are transient, which supports the need for a regular exercise routine in order to achieve clinical efficacy. Our results (i) demonstrate that the signals generated by exercise are true biological response modifiers and (ii) provide the molecular basis for the actions of exercise in suppressing the inflammation observed in rheumatic diseases. Acknowledgements We would like to extend our appreciation to all the volunteers that participated in this study. Our research would not be possible without the time and effort they put forth. We would also like to thank the Center for Clinical and Translational Science's Research Match program at OSUWMC. Funding for this work provided through NIDDK K23DK059850, NIEHS R00ES019918, and the Wexner Medical Center at The Ohio State University. Funding for the Center for Clinical and Translational Science provided through CTSA grant number UL1TR000090.